More than two years ago, I wrote a post on PPC Remarketing: What Not To Do. It was one of the most-commented posts on this blog, with differing opinions on what makes sense. Two years later, advertisers are still doing remarketing wrong. Now, I get that it’s still a somewhat new-ish concept, and not everyone is doing advanced remarketing yet. And that’s ok – we all have to start somewhere. But when I see basic mistakes being made by large companies, it makes me cringe. This was at the very top of the page, above a news article I was reading. The good news? It’s a huge banner – you can’t miss it. How did I know it was a remarketing ad? Because I’ve already booked a stay here. Next week, I’m speaking at a client convention in Los Angeles. I booked my hotel over a month ago. Earlier this week, I dug out the reservation confirmation email, and clicked through a link to prepare for my stay. 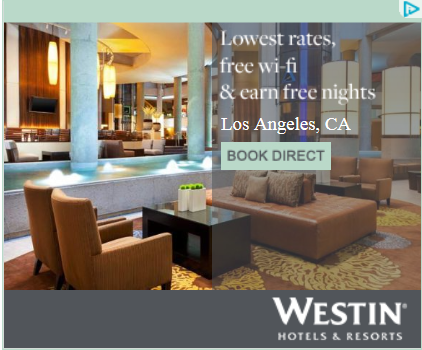 And now I’m being bombarded by ads asking me to book this hotel in LA! How many stays do they think I’m going to be booking? Clearly, this is how not to do PPC remarketing. Don’t target people who clicked through a reservation confirmation email and ask them to book! 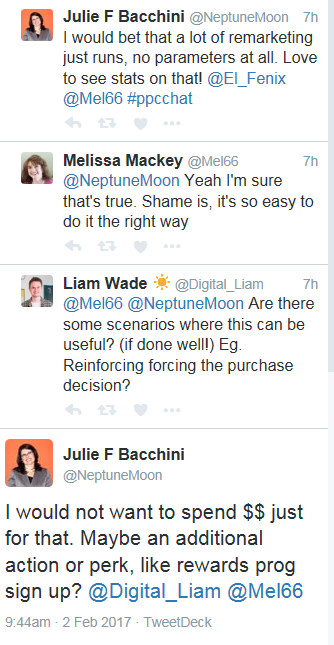 I agree with Julie – I’d love to see the stats on how many remarketing ads just run without any parameters or audiences. I can see serving ads for a perk, as Julie suggests, such as a rewards signup. Or a dining offer at one of the hotel restaurants. Or 25% off a massage in the spa. Or whatever – the point is, remarketing would be highly effective to the already-converted audience as an upsell. It’s not at all effective to ask those who’ve already booked a room to book a room. It’s so simple to set up an exclusion for people who converted. As mentioned earlier, the hotel could set up a PPC remarketing audience of users who visited the site from a confirmation email referral. Failing that, they could exclude everyone who viewed the reservation confirmation page. Fair enough – and I agree, some agencies and/or advertisers don’t link their AdWords and Google Analytics accounts. I get that there are reasons why this happens. But if you can’t do remarketing correctly, you shouldn’t be doing it! I’ve seen similar situations to the one Jason describes: getting remarketed with ads for a product I just bought. 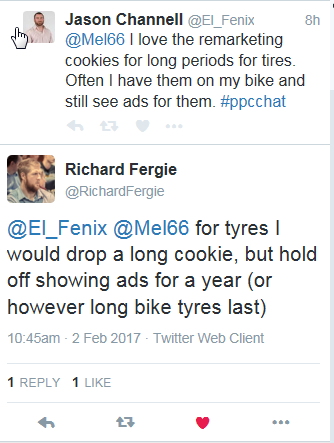 Again, it’s not hard, as Richard Fergie suggests, to drop a long cookie and delay showing ads until you’re likely to be ready to repurchase. Tires do wear out, as do clothes and shoes; food gets consumed; etc. Learn your buying cycle or buyer journey and show ads at the appropriate time. Yes, it takes some research and some time to set up, but this is really what remarketing is designed for – not harassing people with irrelevant ads, but showing them ads that are useful. Have you seen any what-not-to-do remarketing ads lately? Got any tips for the right way to do PPC remarketing? Share in the comments! Some great points here …. 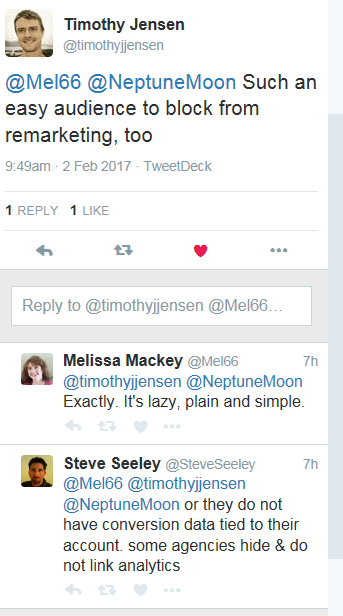 and, yes, remarketing is done very badly, most of the time. There are some basic things you should always do, segmenting for messaging and also excluding converters, etc are obvious ones (to most professionals, at least) and then there are more advanced techniques. My favourite is working on time windows – many repeat purchase items run on fairly specific time windows…. I set up a campaign for an auto insurer. Anyone who visited the site without converting got hit pretty hard for a week or so – but by that time we figured if you were looking for insurance you would already have arranged this in a week. And once you have insurance you no longer need insurance. But then we started the remarketing to you again almost a year later as your policy comes up for renewal. This kind of creative remarketing can be very effective. Simply hounding people that have been on your website until the end of time will never be. Great points, and a good reminder, Melissa. People that travel, often travel a lot. That could be one reason. Further, long-term cookies of someone that converts only work if that person never deletes cookies. Do you know where I can find a good article on remarketing via email? Amazon and Under Armor are two companies that have really impressed me with the way they remember just what I searched and they send me automated emails with the exact products I looked at in the email. Yeah, cookies can definitely impact a remarketing program. And yes, some people travel a lot, but I’d bet that number is a lot smaller than the number of people who travel infrequently. Traveling frequently to the same location is even less common, I’d bet. Unfortunately, I don’t work enough with ecommerce to have good resources on email remarketing. We do a little of it in B2B but it’s not sophisticated, because it doesn’t have to be. If I run across a good article, I’ll share it. Thanks for your comments! Great discussion once again 66. To me this has always been a very simple model. You map your re-marketing strategy right into your customer journey stages. I believe one reason there has been widespread laziness is because advertisers started creating re-marketing campaigns based on the adwords re-marketing tag. This level of remarketing offered very little in the way of data to define a new audience and thus efficiently map into the CJ. Even when they moved to the GA tag they had the same kind of mindset and have not created rich audiences based on all the data provided by GA. End result – Generic re-marketing: If they hit our website, keep following them. Thanks Jerry – great resources! Awesome post Melissa! You have some great points here.